For men dissatisfied with signs of aging on their lower face and neck, cosmetic surgery can restore a youthful profile. Coastal Plastic Surgeons offers male facelift and neck lift surgeries to produce a smoother, firmer facial appearance. Whether men want to boost their confidence in work and social situations, reduce the effects of sun damage, or turn back the clock, facelift and neck lift surgeries can help by addressing loose skin, loss of definition, deep creases around the nose and mouth, and vertical banding on the neck. These procedures allow for a more youthful and chiseled appearance. 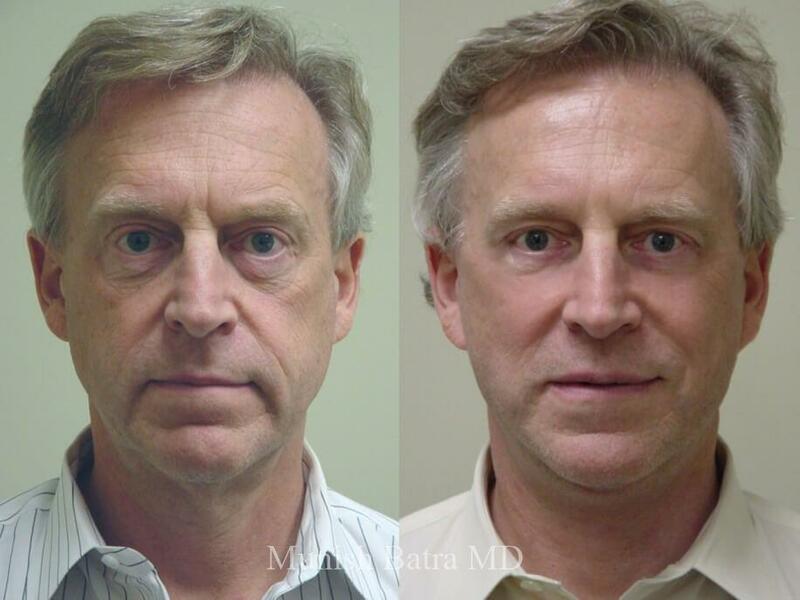 What Can Male Facelift and Neck Lift Achieve? Genetics, aging, and sun damage cause fine lines, wrinkles, and deep creases to form on the lower face. Facelift surgery tightens lax skin and tissues to restore a youthful facial appearance. As the facial skin ages and begins to sag, jowls form along the jawline, disrupting the appearance of a firm and chiseled jaw. Facelift and neck lift surgery tighten and reposition excess skin and tissues to restore an angular jawline. As collagen and elastin break down, vertical banding forms along the neck and becomes one of the most noticeable signs of aging. Neck lift surgery smooths excess skin and muscles while maintaining proper balance and harmony between the lower face and neck. Facelift incisions begin in the hairline at the temple and run down and around the ear. Through these incisions, Dr. Batra tightens and repositions the underlying muscles and removes excess skin. The incisions are closed to reveal a smoother, more youthful profile. Neck lift surgery is combined with a facelift to maintain a balance between the features. Incisions are made underneath the chin and around the ear. The muscles are tightened, and excess skin is removed. Incisions are closed, and a more sculpted and chiseled jawline and neck are revealed. Facelift and neck lift surgeries address aging on the lower half of the face and neck. To maintain balance and for full facial rejuvenation, many men choose to combine their procedures with a brow lift or an eyelid lift. Facelift and neck lift surgeries are outpatient procedures. However, as they are performed under anesthesia, you are required to have someone present to drive you home and stay with you for the first night. Bruising and swelling are expected, and drainage tubes may be placed. Most men feel well enough to return to work and their normal activities after one week. However, most swelling will take at least two weeks to subside. Bruising, swelling, and post-operative discomfort are common after a face and neck lift. You will receive a prescription for oral medication to manage any discomfort. Swelling can also be lessened with cold compresses. Dr. Batra makes the incisions as inconspicuous as possible; however, scars will be present at all incision sites. To minimize the appearance of your scars, be sure to keep the incisions covered and out of the sun while healing. All scars will fade with time. Facelift and neck lift surgeries are specialized procedures that require training, skill, and experience. The cost of your procedure will reflect that. You will be given an accurate cost estimate during your consultation that will include all anesthesia, facility, and surgical fees, as well as the added price of any combined treatments. View our gallery page for the procedures and treatments at Coastal Plastic Surgeons. At Coastal Plastic Surgeons, we believe in our methods and techniques for lasting results that can change your life. We offer procedures on everything from breast augmentation and body contouring, to facial aesthetics, hair restoration, and skin resurfacing. Every treatment is displayed here in our gallery. Am I a candidate for facelift or neck lift surgery? Men hoping to dramatically rejuvenate their facial appearance may be candidates for facelift or neck lift surgery. Most candidates experience dissatisfaction with wrinkles, jowls, and neck banding that is common with age or sun damage. Men should be healthy, be non-smokers, and have realistic expectations of their results. What are the risks associated with facelift and neck lift surgeries? Following all of your pre-operative and post-operative instructions will minimize the chances of these risks. What kind of anesthesia will be used? Facelift and neck lift procedures are typically performed with general anesthesia. Occasionally, local or light general anesthesia may suffice if there is only minimal correction needed. Facelift and neck lift results are long lasting; however, they will not stop the natural progression of aging. To maintain your results, eat a well-balanced diet, do not smoke, and practice sun protection. Why choose Coastal Plastic Surgeons? 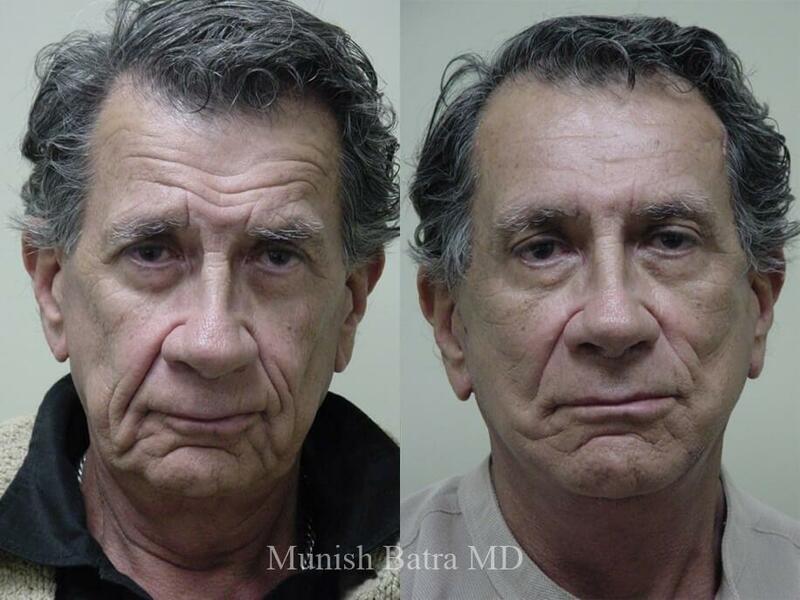 Dr. Batra has performed male facial rejuvenation for over 20 years. Offering extensive, cutting-edge techniques, Dr. Batra and his team at Coastal Plastic Surgeons have the training, experience, and expertise to achieve your ideal results.